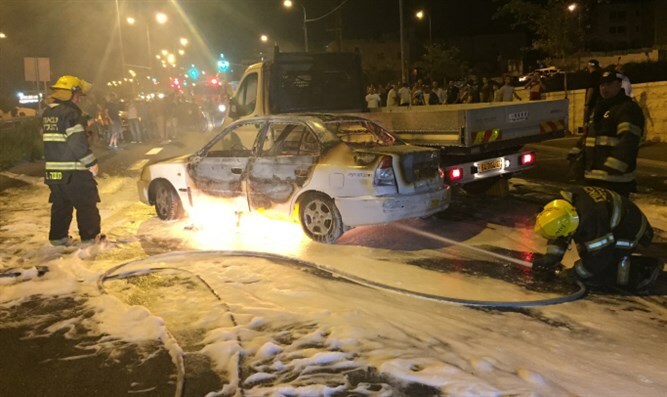 Six Arab residents of Jerusalem were arrested recently in connection with a pair of firebomb attacks on Jewish vehicles in the capital. According to a police spokesperson Tuesday, the six suspects were involved in two separate incidents over the course of a week in which private vehicles owned by Jewish residents of the capital were targeted. The suspects reportedly threw petrol bombs at the vehicles. In both cases damage was caused the cars. The attacks occurred in the A Tur (At-Tur) neighborhood on the Mount of Olives in eastern Jerusalem. The neighborhood has a large Muslim Arab majority, but is also home to a growing Jewish community, including the Beit Orot Yeshiva and several dozen Jewish families. The Jewish enclave in the neighborhood has been subjected to periodic attacks by local Arabs. Authorities say the six suspects range in age from 15 to 17. Following the attacks, Israel Police and Border Police have stationed additional forces in the neighborhood to prevent further attacks on Jewish residents.